Hannah was good friends with my sister in middle school and that was when I first met her. Hannah is that girl everyone loves for her kindness and easy-going personality. I could swear she smiles in her sleep too. So when Hannah first emailed me in August, before she was even engaged, I was so giddy! I could not wait to shoot these two and their Wedding! 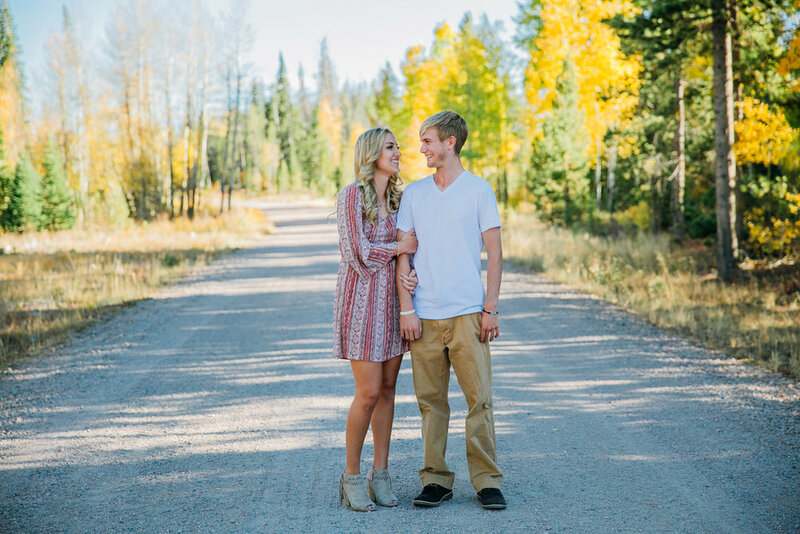 Once they were engaged we started planning out their Engagement photos and Hannah and Drew were going to drive all the way to Grand Junction, Colorado just to have ME take them! Luckily I was able to plan out a last minute trip to Wyoming in September which worked out perfectly for all of us. Hannah really wanted some water in their engagements so I asked if I could take her up to Medicine Bow and she agreed! I hadn't been up to the area in about 5 years so it was wonderful seeing the gorgeous colors throughout. And the wind finally slowed down just in time for our session! This session was an eye opener for me. It reminded me why I love taking couples to the mountains, and why quality time away from distractions is an important part of my sessions. I loved getting to know Hannah and Drew and their story. And I am thrilled I get to be a part of their June Wedding.